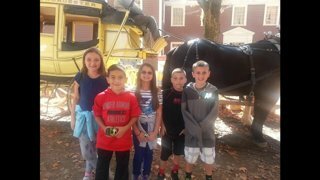 On Friday, October 3rd, Wakelee Grade 4 students visited Old Sturbridge Village in Massachusetts. Old Sturbridge Village is an 1830's New England Living History Museum. The students explored everything from farm animals to militia life, viewed and handled antiques from as far back as the the 1790's, and experienced harvests and agriculture. This trip gave the students a great perspective of life in the 1800's.